I don’t usually go out on substandard days—ones where there is a good chance of rain. It’s not just that I don’t like to get wet (some Oregonian I am! ), but the flowers are wet and often droopy, so it isn’t the best time for photography. But with five days in a row of wet weather forecast, I couldn’t stand the idea of missing so many days of being out in the mountains. On Sunday (June 24), it was actually pretty sunny when I got up. I figured I could get at least a half day in before the rain started if I was lucky. 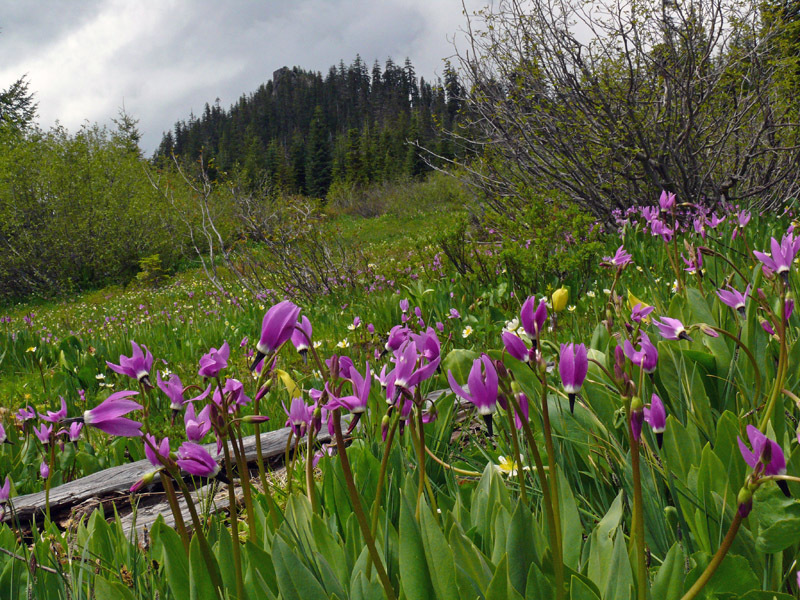 I headed up to Hemlock Butte to see the lovely roadside wet meadows. If it did rain, I wouldn’t be far from the car. 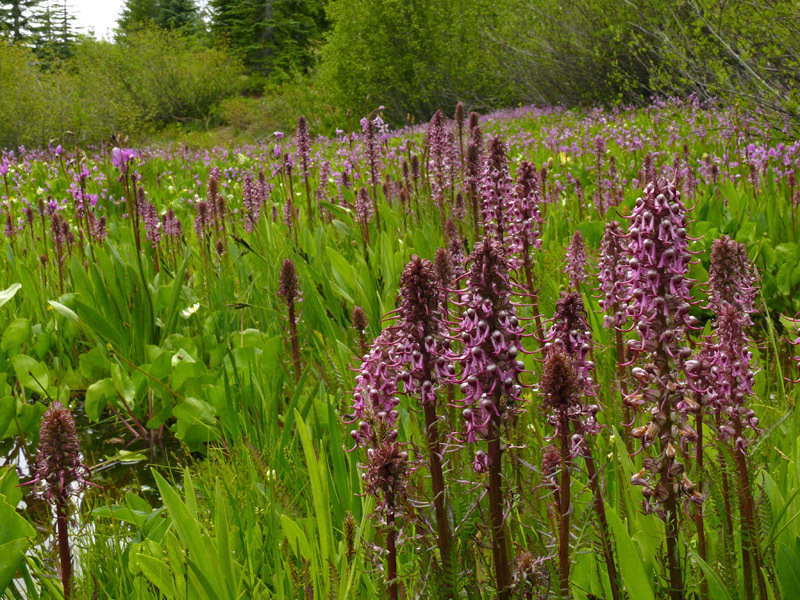 In one isolated spot of wetland, beautiful sweeps of elephant head (Pedicularis groenlandica) were in full bloom. Elsewhere they were only in early bud. 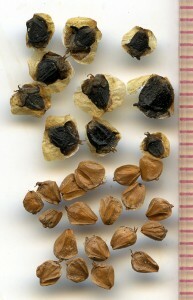 Sitka alder seeds (top) and mountain alder (bottom) are easy to differentiate and, if you can find any left in old cones, they are a good tool to identify the shrubs. On the way up Road 23, I passed a seepy bank filled with clover. Once again, it turned out to be cup clover (Trifolium cyathiferum), the uncommon plant I’d just seen for the first time a week ago. It seemed like a good start to the day. But then it started to sprinkle, and I wasn’t even at my destination yet. It was mostly sunny when I arrived at the wet meadows, though, and they were worth the trip. Sheets of Jeffrey’s shooting star (Dodecatheon jeffreyi) were coming into bloom, tinting many areas with bright pink. The marsh marigold (Caltha leptosepala) were a little farther along but still beautiful. There was also quite a bit of skunk cabbage. 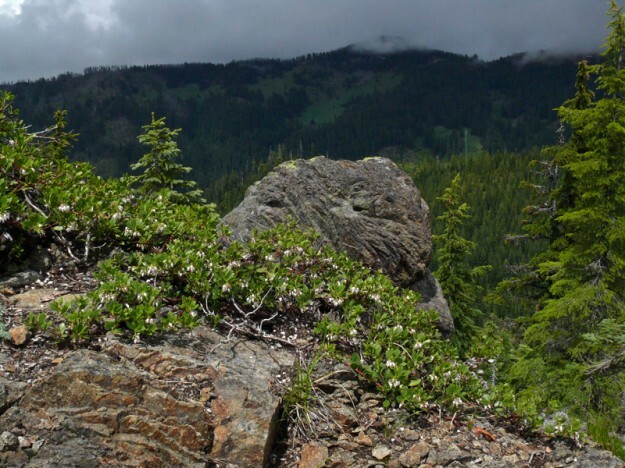 These high mountain plants are so much smaller than those at low elevations. And the little bright yellow Gorman’s buttercups (Ranunculus gormanii) filled all the spaces in between the larger plants. I wandered down the hill through lots of sections of wetlands I don’t think I’d seen before, as they are partially separated by patches of trees or drier beargrass areas. I discovered alpine laurel (Kalmia microphylla) in bloom. I hadn’t seen that here before. Noticing some of the alders weren’t blooming floriferously, I checked to see if they were mountain alder (Alnus incana). 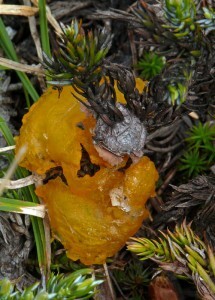 I found some old cones with short peduncles and tan-colored, wingless seeds for confirmation. The more common Sitka alder (Alnus viridus) has seeds with conspicuous, thin wings, and their cones are on long peduncles. They usually bloom profusely. Mountain alder seems to like to be in bogs and other wetlands. Sitka alder grows in both wetlands and on wet avalanche slopes. They do grow side by side in a number of places. Pinemat manzanita (Arctostaphylos nevadensis) was blooming near the summit. I’ve never been to the large meadows across the way on Pinto Mountain, but they look intriguing. This unusual, bright orange fungus was attacking a common juniper (Juniperus communis). After enjoying the wetland for a while, I headed up the short trail to the top of Hemlock Butte, a little rocky knob overlooking the wetlands. Unfortunately, clouds blocked the up close view of Diamond Peak, but I had a little sun on and off. There were lots of harsh paintprush (Castilleja hispida) in bloom, some Lomatium martindalei, and some very early bloomers were still in good flower, most notably glacier lilies (Erythronium grandiflorum) and western springbeauty (Claytonia lanceolata). The very first thread-leaved sandwort (Eremogone capillaris) were coming into bloom. Curved-beak lousewort (Pedicularis contorta) was only in bud. Both of these species seem to be more common to the north of here. It started to sprinkle as I headed down the short trail, and shortly after I reached the car, it started to rain. Good timing as I was about done here. I had hoped to check out one more meadow down the road, but I just drove slowly with the window partly down—really lazy botanizing. After about a half hour the rain let up and the sun returned. I decided to loop back the long way down to Road 21 to check on a couple of meadows and collect some seed. All in all, it was a pleasant day. I’m glad I didn’t let the rainy forecast keep me inside. Still, here’s hoping for a few dry days soon!